Today (Nov 24, 2015), Google is celebrating the 41st anniversary of the discovery of “Lucy” with Google Doodle. Discovered in 1974 in the Awash Valley of Ethiopia by Paleoanthropolist, Donald Johanson, Lucy has been celebrated as a “missing link.” She is said to represent a line of species that had moved to an upright position, walking on her back two legs in a human-like, bipedal manner. The bipedal theory of Lucy’s ambulation is largely based on a study of her hip and knee joints. The mechanics of these joints are said to represent what is necessary to walk erect. The results of this discovery have caused most to celebrate Lucy as an important link that bridges the gap between lower primates that walked like chimpanzees and humans who move on two legs. Obviously, this discovery seems to strongly support the notion that humankind evolved from lower, previous life forms. This skeletal remain seems to be evidence that mankind’s ancestors were once tree dwellers but eventually moved to the ground and began to walk upright. To those who’ve already concluded that humankind is the result of billions of random, unguided mutations, then Lucy fits like a hand in a glove. However, to those of us who are more critical thinkers, the hand in the glove is more reminiscent of a famous scene from the OJ Simpson trial: there’s a problem with the way it fits. Lucy’s knee joint was not found with the skeleton. It is well known, though not well publicized, that the crucial knee joint was found about “two to three kilometers away, and in a layer of rock some 200 feet lower.” Therefore, it is quite possible that the most crucial piece of evidence is actually unrelated to the find. No one can conclusively say that Lucy walked upright. No feet bones were ever found. 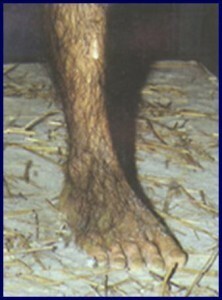 In spite of the lack of physical evidence, Lucy was often recreated by artists and even by museums with human feet. Why? Well, the most obvious reason is because a “knuckle-walking” chimpanzee would not appear as much like a human as a human foot would. To create a human foot out of thin air would seem to make the case for evolution better – even if it cannot be demonstrated to be factual. The skull was so badly crushed it could not be recreated. However, this did not stop the depiction of Lucy as being half-ape and half-human. Creative, artistic license includes science, so it seems. You may recall how “Nebraska Man” was reconstructed from a single tooth – later to be identified as belonging to a pig. I guess some scientists can become rather fanatical in their belief system (as demonstrated by the so-called discovery of the fraudulent Piltdown Man). But for sake of argument, let’s assume that the crucial knee joint found 1 1/2 miles away and 200 feet deeper actually belongs to the Lucy skeleton. And, let’s say that studies of the knee joint demonstrate correctly that the figure had once walked upright. The obvious question becomes: does this prove that Lucy is an intermediate life form between man and ape? Those who wish and hope that evolution must be true will say, “yes!” Those of us who are critical thinkers are not so quick to reply. The critical thinker will recognize that the presence of a skeleton proves that a life form once lived and that it is now dead. It does not prove that that life form married and had babies. In other words, we do not know if Lucy had offspring or what they looked like. We also do not know what her ancestors looked like. That is far more than a skeleton will tell us. If we lined up skeletons that resemble one another, all that we will have is an arbitrary line of skeletons that resemble one another. To insist that they are all related or belong to an evolving life form is more than the skeletons tell us. Each skeleton, or fossil, gives us clues about its own life. They never say anything about their ancestors or offspring. Never. If a conclusion is reached about a skeleton or fossil’s ancestor or children, that conclusion has been imported into the artifact by someone. The conclusion may or may not be correct, but it is always introduced by something other than the skeleton’s themselves. The critical thinker will also want to know if the creationist has a plausible explanation for Lucy. Does Lucy fit into the creation worldview? The answer is: of course. Creationists recognizes that perhaps millions of kinds of animals are now extinct. Some of these animals had bizarre and unique features. It is entirely possible, from the creationist worldview, to believe that a now-extinct primate had different knee structure than those that are known today. Since no one can conclusively determine that humans came from a lower life form, Lucy presents no difficulty for the creationist.